When Izakaya restaurant Donjaka introduced its daily lunches a few weeks ago, it rapidly gained a reputation of being THE PLACE to go for those patrons whose body needs more energy than normal Okinawan size lunches offer. The cozy restaurant in Hamby offers lunch sets, all of which include soup, main dish and iced tea. The pricing is also right, as all dishes cost between ¥550 and ¥800. Besides being very generous in size, to say the least, all dishes are delicious. 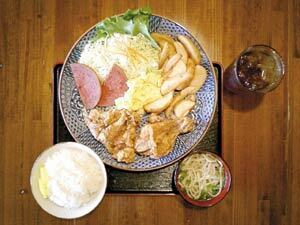 They include Okinawan all-time favorite goya champuru, taco rice and yakisoba, all for as little as ¥600. Okinawa soba is ¥550, fried chicken or pork lunches are ¥700, and at the very top is Donjaka Super Lunch Set for a mere ¥800. Lunch is served between 11 a.m. and 5 p.m. The restaurant is closed on Wednesdays. 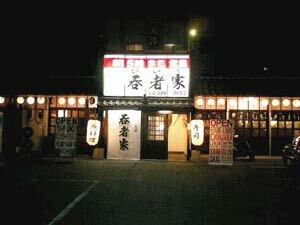 The restaurant changes into an izakaya after 5:00pm, offering typical Japanese pub dishes. “Our emphasis is on the quality,” says Young Ho, who manages Donjaka with his wife Yumiko. “I would say very confidently that we have the best and freshest sushi of any restaurant in this area,” he assures. “I personally like the way our chef prepares the salmon,” Ho says. All restaurant menus are available in English, and there’s always an English speaker on duty during daytime hours. Ho says he is also planning to have English-speaking staff in the evening “as soon as I can hire them”. Donjaka has been in business for nine years. Yumiko’s father, who transferred the day-to-day operations to the young couple when they returned to Okinawa in 2000, originally built it. The couple met while traveling in China in 1997. Ho, who was born in Indonesia of a Chinese father and Indonesian mother, says he fell in love immediately after setting eyes on the beautiful Okinawan girl. “I thought that I will do anything to make that girl my wife,” he says, adding “and I feel the same way today.” The feeling was obviously mutual and they married shortly afterwards. After marrying, they traveled to Hong Kong, Singapore, Philippines and other southeast Asian countries studying local restaurants and food culture before returning to Okinawa. Donjaka seats about 150 people. There is a separate party room for up to 30- 35 customers. The restaurant itself is divided into Japanese style tatami areas, and a section where people can place their feet comfortably under the table. Free parking is available in front of the building. To get to Donjaka, go down towards the ocean from Zukeran and across Highway 58. At the end of the road turn left. Donjaka is on the right about 100 meters from the intersection.